NORTH ANDOVER, Mass. - Junior defenseman Johnathan Kovacevic tied his career-high with a three-point outing that featured three assists and the Merrimack College men's ice hockey team rallied from a two-goal deficit with back-to-back strikes late in the second to tie the game, but a late penalty shot goal was the difference, as Lake Superior State skated away with a 5-4 win over the Warriors in the 2018-19 season opener for both teams on Saturday at Lawler Rink. 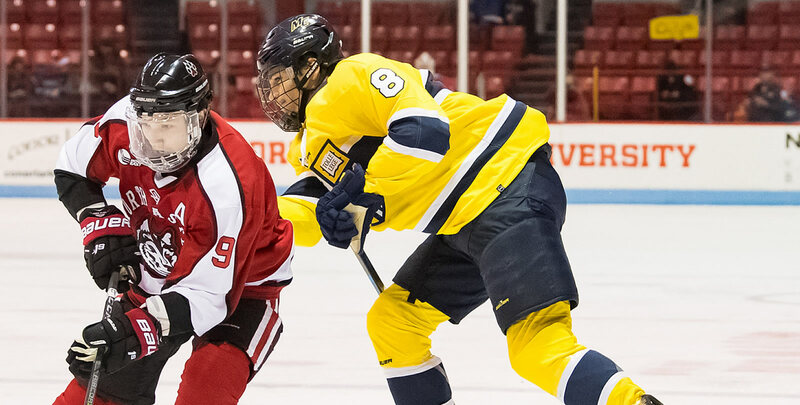 Merrimack scored less than three minutes into the season before both teams combined for three goals in the last three-plus minutes of the opening frame, including one from Lake Superior with six seconds left. The Lakers then built a two-goal lead on the strength of their power play, but the Warriors answered with two tallies late in the second on a power play goal from junior Sami Tavernier and an even-strength strike by classmate Tyler Irvine with only 14 seconds left to make it a 4-4 affair heading to the third. The hosts controlled the bulk of the scoring chances in the final stanza, but a partial breakaway led to a penalty shot for the Lakers, and Anthony Nellis made it count to put the visitors ahead for good. The Warriors had a few more late opportunities with the extra attacker on, but ultimately fell by one. - Goal #1 (MC, 1-0): Sophomore Jackson Bales netted his first career goal 2:48 into the game. Junior Cole McBride took the puck away in the right corner and found rookie Chase Gresock behind the net, who found an open Bales in the slot for a one-timer glove side. - Goal #2 (LSSU, 1-1): Brayden Gelsinger evened the game on a shorthanded breakaway, taking the puck away at center ice and beating the defense with a deke to the backhand and scored at the back post. - Goal #3 (MC, 2-1): Sophomore Laine McKay gave the Warriors the lead back at 19:06 of the first, redirecting a shot from Kovacevic in the slot with the Warriors on the power play. - Goal #4 (LSSU, 2-2): Diego Cuglietta tied the game for the Lakers on the power play at 3:58 of the second. A shot from Jacob Nordqvist was initially stopped, but Cuglietta cleaned up the loose puck in the crease area to even the match. - Goal #5 (LSSU, 2-3): Cuglietta put the Lakers ahead while on the power play again, redirecting a point shot from Nordqvist in the slot. - Goal #6 (LSSU, 3-4): Lake Superior's third straight power play goal made it a two-goal lead at 13:38 of the second. Collin Saccoman took the puck in the neutral zone and found Max Humitz at the blue line. Humitz beat a defender and came in alone at the left wing and scored short side. - Goal #7 (MC, 3-4): Tavernier got the Warriors within one while on the power play with 2:57 left in the second period. Junior Logan Coomes found Kovacevic at the point, and his shot was tipped by Tavernier on the way in for his first of the year. - Goal #8 (MC, 4-4): With only 14 seconds left in the second, Irvine lit the lamp for his first of the year to tie the game at 4-4. Kovacevic tapped the puck in the neutral zone up to classmate Tyler Drevitch, who entered the zone and fed Irvine who dragged around the LSSU goaltender and tucked it in at the glove side post. - Goal #9 (LSSU, 4-5): Ellis scored on a penalty shot at 15:54 of the third to give the Lakers the lead for good. - Kovacevic's three assists tied his career-high; he last totaled three points on Nov. 10, 2017, in a win against Bentley. - Bales scored his first career goal, while Gresock posted his first career point. - Lake Superior pulled ahead in the all-time series, 2-1-0; it was the first meeting between the two schools since March of 1988 when they met in the 1988 NCAA Tournament Quarterfinals. Merrimack and Lake Superior conclude their weekend series tomorrow afternoon back at Lawler Rink, with puck drop set for 4 p.m.